Click the photo to see an up close shot of that HAIR! Squash Malaria! Throughout Lent, Sunday School collected pledges for mosquito nets for children throughout the world where malaria is an epidemic problem. One mosquito net costs $6, and can protect 3 children. Pastor Lynne stepped in and encouraged us to set a goal–not an impossible goal, but one that was challenging. 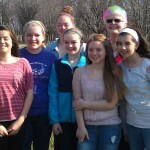 She promised to let the children paint her hair if we met the goal. Our goal? 100 nets; Our total–nearly 114! 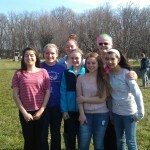 $686.00 was raised! 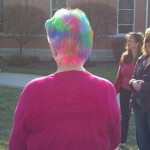 On Sunday, April 7, the Sunday School kids spray-painted Pastor Lynne’s hair out in the church yard! Lots of smiles were shared by all!